SVT has just run one of the biggest remote production events ever for the Alpine World Championship, and Net Insight has delivered solutions to enable it. Together we’re setting a new benchmark for live remote production at a major sporting event. 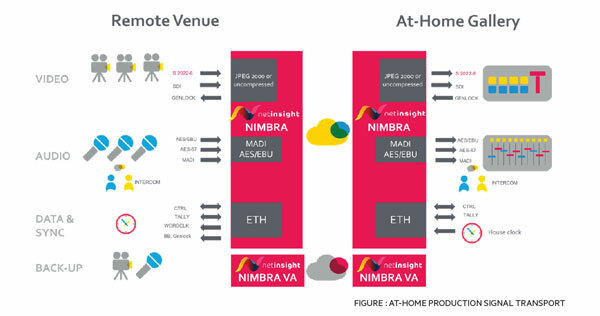 Net Insight showcased the first live remote production together with IRT Broadcast Technology Institute between Munich and Amsterdam already back in 2006. In this Expert Insight, we will elaborate further on the evolution of remote production into what we call Remote Production 2.0. This is already to a large extent what SVT is doing. Remote Production 2.0 – What is it? Remote Production 2.0 is a concept to evolve traditional remote productions. We realized it was not enough to only bring the signals back but to improve and ensure the entire workflow. We also wanted to make it ready for a full IP and new ST 2110 productions. To create an entire partner ecosystem supporting all components of a remote production was critical and we have worked with partners such as Grass Valley, Calrec, Riedel and Embrionix to ensure a smooth production experience. Grass Valley was also a key partner to ensure a remote camera control and allow for the production to keep cumbersome camera equipment like the camera control base stations and control at the home studio, minimizing the amount of equipment at the remote site. This has been a key requirement for SVT in the alpine World Championship. Remote Production 2.0 puts harder requirements on the network to ensure high quality, very low delay and synchronization of the video and media feeds. Since you actually matching the cameras remotely and doing coloring and shading from the central studio, the end-to-end delay has become more critical. To minimize delays, people often ask to run uncompressed but with encoding solutions such as JPEG2000 or TICO the delay is low enough that it is on pair or even lower than the physical delay to transport the signal over the fiber. Using built-in low-latency encoding in the network equipment can thus give the same production experience but significantly reduce the cost of the total solution. Remote Production 2.0 is format agnostic in that it works for normal HD cameras as well as more sophisticated 4K and Superslowmotion-cameras. Even though designed for full IP workflows including new ST 2110, we see a big need from our customers to handle hybrid environments with SDI, 2022-6 and ST 2110 equipment. It is therefore important to enable such mixed environments reducing the need for costly forklift upgrades for the broadcasters and production companies. When moving to new IP workflows, one of issues customers come to us for help with is how they can ensure correct synchronization and frame alignment across IP networks. In ST 2110, synchronization with PTP and ST2059 are key aspects and it is important to ensure that all equipment is referenced with the same clock. However, this is preferably also in hybrid environments. Often people are forced to use local GPS clock or dedicated PTP infrastructure increasing cost and complexity. For certain use cases such as when working with Superslowmotion-cameras or video assisted referee systems, synchronization and frame alignment is extra critical and it is not enough to ensure equipment is using the same clock but the solution will need to also handle actual time stamping and frame alignment at the receivers. To summarize, Remote Production 2.0 makes it possible to do more production with less resources and enables new and more efficient IP workflows. It also opens up for the next evolution of media production that evolves into distributed production where different parts of the production, such as video, graphics, audio and commentary can sit at different sites or, in some cases, even at home. Thanks for the reading and to read more, tune into our web page on Remote Production.